We have a credo at Prolific: Partners, not clients. This guides the way we interact with every brand and presents a fresh challenge for every project. Because not only are we tasked with the obvious – building a beautiful, useful product – we also work to integrate ourselves into our partners’ pre-existing teams. This means taking time to assess the current state of the business and tailoring our approach to meet their needs most effectively. We don’t just go in with a cut-and-paste plan and start work with preconceived ideas, we learn about their team, existing products, and capabilities, and then put together a strategy built to serve them best. It’s a few extra steps up front, but it yields meaningful results as we work and build together. No canned ideas, no building on something broken, no shortcuts. Being a partner means understanding where they are, and using our resources to make something that really serves users and the business. Apps don’t inherently solve problems. So as important as it is to build a product that looks nice and works well, what ultimately drives an app’s success – what makes it an asset to a company – is different each time. That’s why we spend time getting to know our partners and joining their teams – or, in some cases, helping to build the team. We co-locate to immerse ourselves in the company culture and understand the team’s process. When we truly know the brand and its users we can problem-solve with the competitive edge of an in-house team. Prolific recently partnered with The Wing – a co-working and community space for women – to build and launch a mobile app. It was an exciting opportunity, and a great challenge to join their team in such a pivotal part of their company’s growth. Because The Wing is so young (they were founded in 2016), and have expanded exponentially in the short time they’ve been operating, much of what they’re doing is pioneering work. When we partnered with them, we found that rather than joining an existing team, we would be laying the groundwork for the product and tech teams. It was crucial to the business’ growth that we partner with The Wing to build an infrastructure that could support its growth over the next 3-5 years. As we got to know The Wing, we were able to identify two primary objectives that would help resolve some of their short-term issues and ultimately serve their long-term goals. The first was creating more ways for members to connect with each other. Many members reported wanting a way to find like-minded users, and a better way to initiate those connections. Even with the varied ways for members to meet – The Wing’s community team does a great job at helping foster 1:1 connections and there are a variety of events where members can get to know each other – the mechanics of connecting with someone could be a little tricky. We wanted to reduce the friction associated with actually reaching out to someone. So our first task was to rejuvenate the user profile to make it more compelling for members to share more about themselves. We also took it a step further and created a really fun and engaging onboarding flow that makes it super easy to update your profile. As more members fill out their profiles, others will follow suit, so having a completed profile becomes the standard. We wanted to make sure that members could see that by participating in the community they make it more powerful and can get more out of it – beginning with personalized community recommendations. Now that we are on the path to having more robust and interesting data about our members, the next step is making it really easy to connect with them. This is what we’ll be focusing on next as we continue to think about how to make the app a vital part of the Wing community and experience. 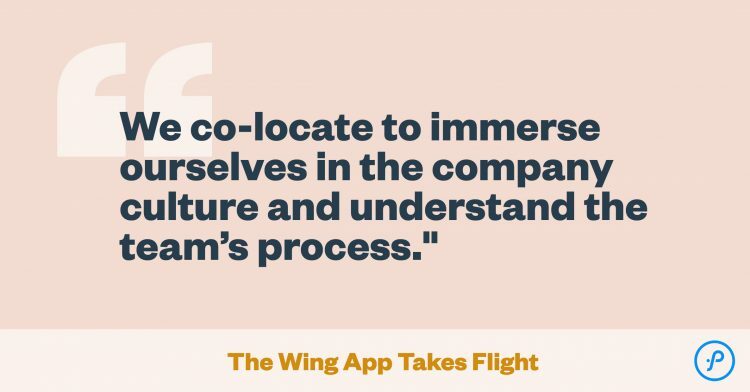 As The Wing grows, the community is shifting from an in-person network here in New York to one that spans the globe. One of the most interesting product and community challenges we face is figuring out how to scale that community online while maintaining the essence of what makes The Wing feel like home. “Happenings” (or events) are at the heart of what The Wing is about. These gatherings – everything from embroidery lessons to documentary screenings to talks by high-profile speakers like Hillary Clinton – drive value and help members build community. We expect that frequent event attendance is a leading indicator of a high retention rate. But as we got under the proverbial hood, we realized that members were having multiple layers of difficulty RSVPing and attending the events they were interested in, and many events had long waiting lists, only for the events themselves to be partially empty. There was clearly a disconnect. Adding to this friction was the instability of the MVP product – like many MVPs – wasn’t built with scale in mind, which resulted in poor performance and crashes during high traffic times when users were notified about upcoming Happenings. To resolve these issues, we made a number of improvements to the infrastructure to ensure the site was ready to scale as The Wing’s membership grows. We worked with The Wing’s events team to rethink the way events are announced, opting to post Happenings well in advance of opening reservations. This allows members to check out upcoming programming and decide what works with their schedule, and eliminates a mad scramble of panicked RSVPs in each week. We think this will lead to fuller, more vibrant gatherings, too. As a partner to The Wing, we were able to move beyond the limitations of a vendor. Rather than build a product that met a short-term need, we joined their team to create something that will serve them and their business much longer. Partners, not clients. No more shapeless strategies, no more building a product for a product’s sake. We solve real business and user problems by digging in and acting as an in-house team. We create holistic strategies and bring innovative products to market that push the business – and industry – forward.